Lots of action is packed into these Legend Eagle USA Awards. The eagles in the award are raised providing a 3-dimensional look. 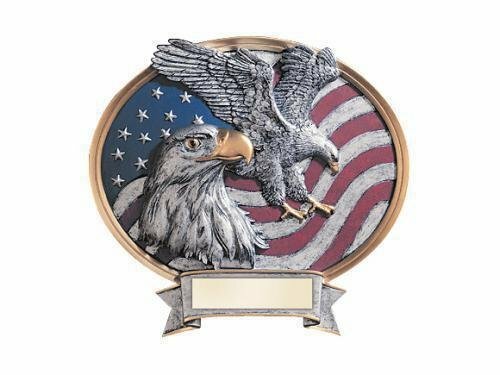 Two finely detailed eagles grace this award, one shows a proud eagle head, while the other is shown in full flight with wings wide and talons set to capture its prey while the beautiful red, white, and blue of the USA flag completes the scene. These oval awards are available in your choice of two sizes, 6 1/2" X 6" and 8 1/2" X 8". A large area at the bottom of the award can accommodate your personalization needs while the gold and pewter finish complement the look of the award. This item can either be hung on a wall or placed on a desk using the included stand. 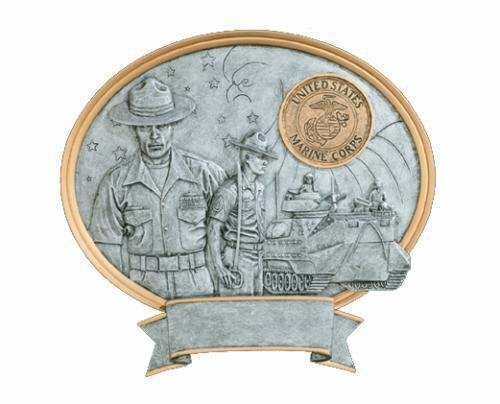 You have lots of choices with this Legend Marine Award. The icons in the award are raised providing a 3-dimensional look. A Marine drill instructor is depicted while an amphibious assault vehicle is pictured in the background to complete the scene. 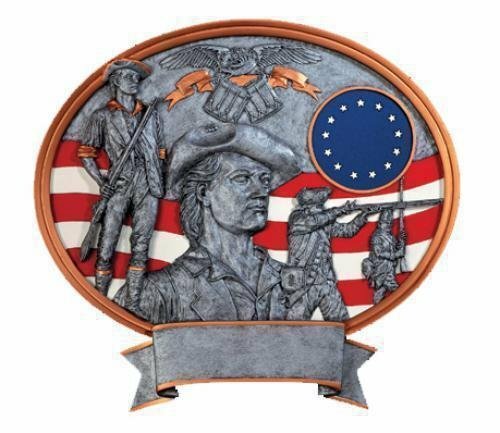 Additionally, you can also choose a 2" Mylar to highlight a specific achievement or that space can be left alone to show the Marine insignia. This oval award measures 8 1/2" X 8". A large area at the bottom of the award can accommodate your personalization needs while the gold and pewter finish complement the look of the award. This item can either be hung on a wall or placed on a desk using the included stand. You have lots of choices with this Legend Minute Man Award. The icons in the award are raised providing a 3-dimensional look. Several Minute Man in full dress are depicted while the red and white stripes of the US flag are in the background to complete the scene. Additionally, you can also choose a 2" Mylar to highlight a specific achievement or that space can be left alone to show 13 stars in a circle pattern to represent the original 13 Colonies. This oval award measures 8 1/2" X 8". A large area at the bottom of the award can accommodate your personalization needs while the gold and pewter finish complement the look of the award. This item can either be hung on a wall or placed on a desk using the included stand. You have lots of choices with these Legend Navy Awards. The icons in the award are raised providing a 3-dimensional look. A crew member is depicted saluting while an aircraft carrier is shown with a jet in flight to complete the scene. 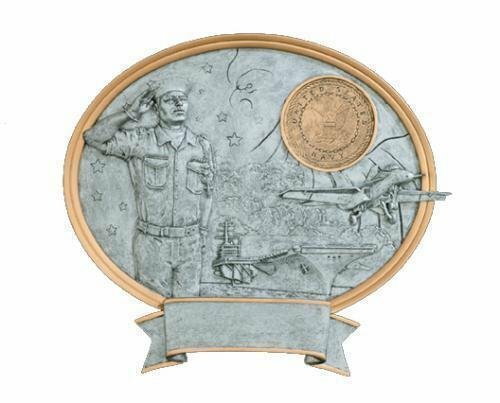 Additionally, you can also choose a 2" Mylar to highlight a specific achievement or that space can be left alone to show the Navy insignia. These oval awards are available in male or female version and measure 8 1/2" X 8". A large area at the bottom of the award can accommodate your personalization needs while the gold and pewter finish complement the look of the award. This item can either be hung on a wall or placed on a desk using the included stand. Phone: 785-843-3900 Toll-Free: 800-466-5495 Fax: (785) 843-3913 Powered by BizWizard ShopKart by NetSoft Studio, LLC.